Ten sailors missing after the USS John S. McCain collided with a tanker ship were named by the U.S. Navy on Thursday. The desperate rescue mission has now become a grim search for bodies in the flooded compartments of a damaged destroyer and surrounding waters. “After more than 80 hours of multinational search efforts, the U.S. Navy suspended search and rescue efforts for missing USS John S. McCain (DDG 56) Sailors in an approximately 2,100-square mile area east of the Straits of Malacca and Singapore,” the Navy said in a statement. The statement served as grim acknowledgement that they don’t expect to find any of the unaccounted sailors alive. The Navy also announced its divers had recovered and identified the remains of Electronics Technician 3rd Class Dustin, Louis Doyon, 26, of Suffield, Connecticut, during their search Thursday night. 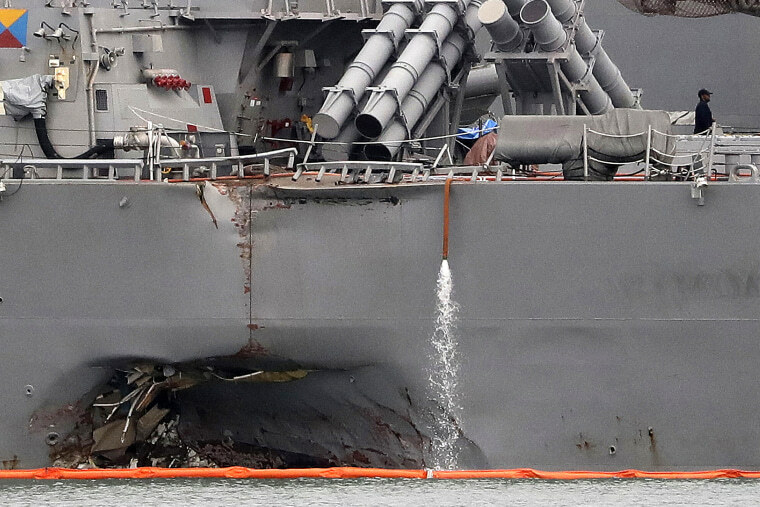 Two days earlier, the remains of several sailors — among them 22-year-old Electronics Technician 3rd Class Kenneth Aaron Smith of Cherry Hill, New Jersey — were found in the sealed compartments of stricken Navy ship. Named after the father and grandfather of Arizona Sen. John McCain, the 8,300 ton destroyer had finished patrolling the South China Sea and was heading to Singapore when it collided Sunday with a much larger 30,000-ton ship named the Alnic MC. It was the second time this year a destroyer based at the 7th Fleet’s home port of Yokosuka, Japan, was involved in a collision at sea — and the fourth mishap this year involving a Navy vessel in the Pacific. In the aftermath, Vice Admiral Joseph Aucoin, the commander of the U.S. Navy’s 7th Fleet, was relieved of his post. And Chief of Naval Operations Adm. John Richardson ordered that Navy operations around the world be paused on Wednesday so a full safety review could be done.